As China's Military Grows, U.S. Assesses Risks The U.S. military is at a turning point. It has just pulled out of Iraq, it is starting to wind down its effort in Afghanistan, it's shifting its focus to Asia, and the Pentagon budget for next year will shrink after a decade of huge increases. 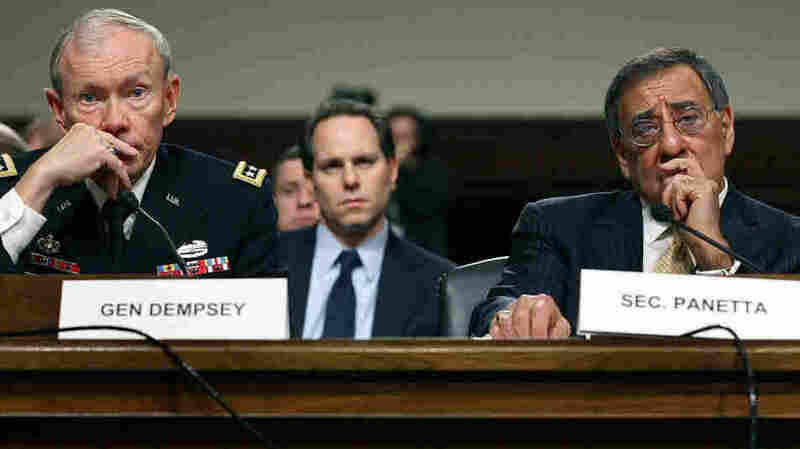 The defense secretary and the head of the Joint Chiefs spoke about the changes to Congress. Defense Secretary Leon Panetta (right) and Chairman of the Joint Chiefs of Staff Gen. Martin Dempsey listen to questions during a Senate Armed Services Committee hearing on Capitol Hill Tuesday. Both men spoke about the U.S. military shifting its focus to Asia. At the White House on Tuesday, President Obama greeted China's Vice President Xi Jinping and called for cooperation between the two nations. Later in the day, the Chinese vice president crossed the Potomac to visit the Pentagon, where the U-S military may hope for cooperation, but has to plan for possible confrontation. The Pentagon's new budget request, unveiled Monday, signals a shift for the US military, with a greater focus on the Pacific. China is building more ships and aircraft, and is now patrolling hundreds of miles out into the Pacific. China's satellites and surveillance aircraft are shadowing American carrier groups. Its warships are provoking Japanese and Vietnamese ships. China's military might, says the new Pentagon strategy, is causing friction in the region. "Rising powers in Asia are testing international rules and relationships," Defense Secretary Leon Panetta told the Senate Armed Services Committee on Tuesday. "We will rebalance our global posture and presence to emphasize Asia Pacific and the Middle East, because those areas represent the threats for the future." Panetta didn't say China was one of those threats. Yet no one doubts that China is the reason the U.S. will maintain eleven aircraft carriers, develop a new long-range bomber, and work with allies like Australia and Singapore to base combat troops and ships in those countries. We will rebalance our global posture and presence to emphasize Asia-Pacific and the Middle East, because those areas represent the threats for the future. For the most part, though, China's intentions remain a question mark. David Finkelstein, a China expert at the Center for Naval Analyses, a government think tank. "We're really at a point now where for the first time China has accrued operational capability to project force further out from their shores and in their airspace than ever before." Finkelstein says that Chinese military leaders believe they are a global economic power, and must create a military to protect their interests. That's why the Pentagon is pushing for that new long-range bomber and stealth aircraft. They could be used to penetrate Chinese airspace, largely unseen. But the idea of a Chinese military that can really challenge the United States is still a long way off. A more immediate concern is China's skill at cyberattacks — the ability to hack into or even destroy computer systems, both commercial and military. Chinese military strategists have made cyber war-fighting capability a priority. So the new Pentagon budget sets aside more than $3 billion for cyber operations and defense. At Tuesday's Senate hearing, Republican Lindsey Graham of South Carolina asked Chairman of the Joint Chiefs of Staff, Gen. Martin Dempsey, about the growing cyber capabilities of China's military. Dempsey said he would consider cyber attacks to be a crime, or possibly even a "hostile act." Graham told Dempsey he would be having lunch soon with China's vice president. "So what do you want me to tell him?" Graham said. "Happy Valentine's Day," Dempsey replied. The committee chairman, Sen. Carl Levin, a Democrat from Michigan, told Graham to pass on another message: cyberattacks from China are mighty serious stuff and must stop.